"Continuation" Cobra sports car. Although Carroll Shelby discontinued importing cars from AC in the UK in 1967, AC Cars continued to produce the AC convertible with coil spring suspension, non flared wings, and powered by the small block Ford 289 V8 engine. Designated the AC 289, it was marketed throughout Europe until production ended in 1969. In 1982, the AC 289 continued to be built by Autokraft, an AC Cobra parts distributor, and was renamed the Autokraft Mark 4. In essence, it was a Mark 3 AC Cobra with a 302 ci (4.95 litre) Ford V8 engine, linked to a five speed Borg Warner T5 gearbox. Following litigation by Carroll Shelby, production soon ended, but restarted in 1987 in a joint venture between AC and Ford whereby the Mark 4 was renamed the AC Mark 4, and powered by the same 302 ci Ford V8 engine. This developed 250 bhp at 4200 rpm, and produced a top speed of 134 mph, and a 0-60 mph time of 5.2 secs. In 1990, a lightweight version was introduced with output increased to 370 bhp at 5750 rpm by using an aluminium head, a single Holley 4-barrrel carburettor, and removing the catalytic converter. Production of both variants ended in 1996 when a combined total of 480 units had been built. 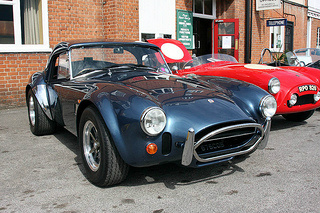 In 1996, AC Cars was restructured with new management and, a year later, the company launched two cars with body styling similar to that of the Cobra. The first was the Superblower, with an aluminium body, and powered by a supercharged 302 ci Ford V8 engine, developing 320 bhp. The other was a more keenly priced car called the Carbon Road Series (CRS), with a carbon fibre body, and a detuned 302 ci Ford V8 engine developing 225 bhp. When production ended in 2001, 22 Superblowers and 37 CRS's had been built. The first pre-production AC Cobra 260 sports car had a chassis number CSX2000 and, in total, 655 of the small block 260 and 289's were built, which meant that the last one would have been CSX2655. This variant used the same chassis as the AC Ace, with "cart horse" leaf spring rear suspension. In 1965, the long overdue design of the chassis took place, and involved additional strengthening, and replacement of the leaf springs with all round coil spring independent suspension. The chassis number of the first Mark 3 AC Cobra, with the 427 engine and new chassis, was CSX3000. Since, by 1967, when production of the 427 Cobra ended, a total of 344 units were built, which meant that the last unit would have been CSX3344. In the late 1980's, the 427 Cobra was reborn, with the first unit designated CSX4000. The new series of this iconic model was given the title "Continuation Cobra". These "Continuation" sports cars were initially built in Las Vegas, and sanctioned by the Shelby organisation. The concept was to recreate the original 1960's icon, but with latter day additions. Understandably, it was the 427 S/C Shelby Continuation Cobra that was most in demand, and was to continue on where production of the final 427 S/C ended, which was around CSX3560. In 1996, the first CSX4000 sports car used a chassis built by McCluskey Limited, together with the newly produced components, and rebuilt Ford V8 engines. 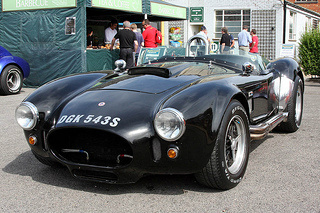 The majority of Continuation Cobras were built with fibreglass bodies, although some were ordered with bodies made from aluminium, and even carbon fibre. Since 2009, Continuation 289 and 427 Cobras were built by AC Heritage in the UK, under license to AC. In 1965, AC produced only 19 rolling chassis for the 427 Competition Cobra, and two of them, CSX3015 and CSX3303, were modified with the addition of two Paxton superchargers to develop 800 bhp. The resultant 427 Supersnake was built to be a road going variant. Only two such Supersnakes were ever built, and Carroll Shelby kept CSX3015, whilst he presented CSX3303 to his friend Bill Cosby. In 2007, CSX3015 was sold at auction for $5.5million.